Onkyo E700M review | What Hi-Fi? If Evander Holyfield were to suddenly appear in your living room, you’d somehow just know he was there. The same can be said for one of Onkyo’s AV receivers – industrial and powerful, they have a certain presence, bordering on the menacing. 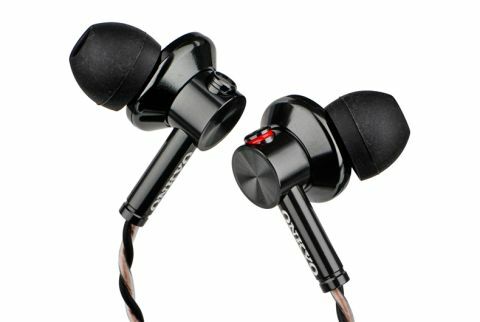 So, it’s even more impressive that the same company can produce such an attractive product as the E700M in-ear headphones. At £75, the Onkyos join the highly competitive sub-£100 sector of the marketplace, where they face tough competition from the likes of Sennheiser and Beyerdynamic. With this pricetag, we expect quality materials to have been employed in the construction, and you can certainly tick that box. Housed in a robust aluminium body that envelops the 13.5mm high power drivers, the E700Ms exude class. This is underlined by the 1.2m dual coloured twisted cable and inline microphone. The E700Ms are supplied with three pairs of silicone caps and one pair of Comply foam tips. Once we found the right ones for us, the fit is snug and comfortable. We kick off with Primal Scream’s Vanishing Point – a wonderful multi-layered recording, full of rich textures lurking in the bushes and waiting to ambush any headphones that aren’t quite up to the job. The Onkyos survive this test. They have an agile and articulate sound that can track the various instrumental strands of the song well. Detail levels are decent, with the E700Ms giving a good degree of insight into the production. There’s a pleasing consistency of character from the lowest frequencies upwards and we’re pleased to report that Onkyo hasn’t fallen into the trap of over-egging the bass in the way many rivals have done. Yet, things aren’t perfect. The company has, if anything, gone too far the other way, delivering lows that are a little too thin and restrained. They lose a little too much in the way of substance and authority to truly convince. There are issues at the other extreme of the frequency range where treble sounds thin and a touch hard despite plenty of running. It makes listening to compressed pop recordings harder work than it should be. We’d like crisper timing too and more expressive dynamics, particularly through the midrange. Play an iTunes version of London Grammar’s Hey Now, and Hannah Reid’s vocals lack the smooth and balanced sound we’d expect from a pair of headphones at this price, certainly compared to the Award-winning Sennheiser Momentum M2s. Like the company’s amplifiers, the Onkyos have a presence. The build is good, but that’s not enough to earn our recommendation, not when just a little more money buys the hugely superior Sennheisers.